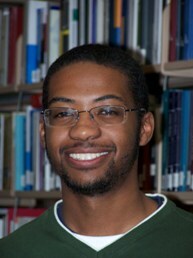 Phylis Wright, manager of Access Desk Services and the Library’s University Staff Council (USC) representative, announced that Michael Murray is Falvey Library’s first Student Worker of the Month for 2011. Michael, a senior English major, works for Darren Poley, outreach librarian, helping set up library events, and for Stephen Spatz, assistant outreach librarian, working on the Community Bibliography. 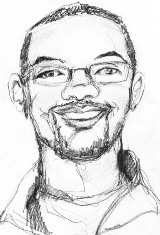 Michael, from Sicklerville (N.J.), likes to read, play basketball and work with the youth group at his church. He has worked for Darren and his team since August of 2009. The Student of the Month idea originated with Phylis who then consulted Library Director Joe Lucia and members of the Falvey USC team who agreed that this is an appropriate way to honor student workers. At the start of the semester Phylis asked for nominations of outstanding students. She noted that the USC team “received so many [nominations] that our . . . team is finding it a difficult task to choose . . . [the winners]” – a very nice comment on the quality of Falvey’s student workers! Way to go, Michael! Congrats!! Congratulations Michael! And if Falvey asked my opinion of you…the article singing your praises would be twice as long! And lucky you to have a personal drawing by THE Joanne Quinn. Congratulations to Michael. It is nice to see someone so hard working and diligent receive this award!